Why was OMSB planted? Originally for a drought reserve, windbreaks, shrub layer into landscape and as an additional feed source. It adds to the smorgus board of feed for animals. 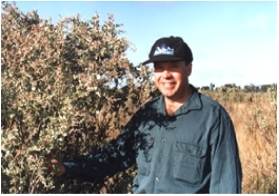 My reasons now are more for longterm benefits for the land because Im understanding saltbush more each year, especially as to how and where it fits in. What grazing and pasture benefits have been observed? Certainly seen a big benefit on the stock for both wet and dry times. The dry times benefits are self explanatory. It is the wet times that surprised me as saltbush seems to give good feed at a critical time and the animals do better as they are eating away from the sour grass that has little body. It has to be better for worm control because stock are eating off the ground. It does provide a great increase in stock numbers all year. In the alleyways of saltbush that we use, the grass and saltbush work well together. It does not seem to take any of the moisture away from the grass and in fact the grass growth close to the bush is often better. Grass grows well right up to plant. What financial benefits have been observed? Higher carrying capacity, and a better ability when in dry times to come up with better management decisions. That always means more profit when you have greater control. I now do look forward to dry times as it gives me the chance to do the opposite to what most other people have to do. The other good thing is that it is a one off expense. You dont need to keep paying for it. Biggest OMSB impact? Probably the ecological impact as we now can make better decisions for the country. You can increase stocking rates without putting a downward pressure on the ground ecology. That is different. It is the old man saltbush that allows you to do that with its deep roots and better nutrient cycle. It cares for the ground. We have more earth worms now and you just know the soil has more carbon. Our ground holds more water. Any problems with OMSB? Getting to understand the management. In really wet years it doesnt seem to like wet feet too much, but then that is not really a big problem because you have plenty of other feed. Do you / if you had a salinity problem, do you think OMSB would help with controlling deep drainage and/or lowering the water table? Yes, undoubtedly. Its a lot better option than the trees for controlling the watertable and it must make you more money from grazing than what trees would. I think the animal microbes help the salt problem also. Would you like to increase your area sown to OMSB? Yes and we will be. What limits your planting of a larger area? Not really any, possibly capital and time. "Indecision is the basis of flexibility" -- button at a Science Fiction convention.